In addition to the OpenVPN process itself, the kernel must also know about the correct MTU so packet size could be adjusted before reaching the tun/tap interface. This is very easy to do in Linux. In fact you most likely do not need to do anything at all. OpenVPN will adjusted the MTU of the tun/tap interface while creating it. You can check the interfaces effective MTU by using ip link show or ifconfig command. The same however can not be said about Windows. In a typical scenario, OpenVPN is not even directly responsible for creating the said interface. Instead, it requires the interface to be already in placed (which is achieved by calling tapinstall.exe during the initial setup) and then it would connect to it. So even though you have specified your MTU settings in the OpenVPN profile, at least at the time of writing, this does not reflect the MTU of the interface that Windows kernel would see. Luckily (or so it seems so at first) windows TAP driver comes with a setting to easily adjust its MTU. Open Start Menu, search for Device Manager and run it. 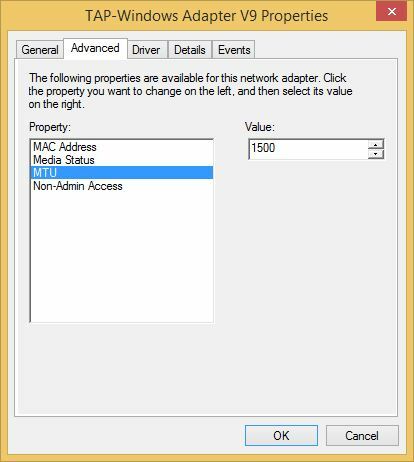 Under Network adapters double click on TAP-Windows Adapter V9. under the Advanced tab, the MTU property can be adjusted. This error usually happens when there are no usable network interfaces or routes. It could also happen as the result of an internal network issue. In other words, this error happens before our packets even get a chance to go out. The reason behind it is not exactly clear to me and possibly requires reading the TAP driver source code to see how the set MTU is being handled. My guess however is that this MTU setting simply tells the driver to reject the packets bigger than the specified value 1. When you change it to something lower than 1500 (which is the default for network adapters), windows network stack still has no idea the MTU of the interface is changed. The driver responsible for the TAP virtual interface however, rejects bigger packets right away. This results in an effect similar to a link with broken PMTUD. Windows provides us with a way to properly adjust the interfaces MTU. The correct way to so is via netsh interface and works from windows vista upward. In my case, “Ethernet 2” is the TAP interface. Inspecting the packets with Wireshark also confirms proper fragmentation of them. If you also use IPv6, the same procedure for it is likely required (replace ipv4 with ipv6 in the above commands). Update: Thanks to the Kaspersky, this now has gotten complex enough to earn its own dedicated post. If you’re running Kaspersky products, some extra steps are needed which are provided in This Post.